I live fairly close to several parks, and my regular readers know I frequent Turkey Creek Sanctuary, and the descriptions and photographs of my trips there make up the better part of my blog. I do try to find a balance of exploring other areas nearby and keeping track of what’s going on at Turkey Creek Sanctuary throughout the year. If I were a mere “lister” birder, I would more likely travel farther across the region to snag birds for my lists. As it is, I find repeat observations and comparisons are vital to understanding birds and their place in the environment. This past weekend I returned to the sanctuary to do such a check. Summers are usually quiet times for finding birds in many of the area parks. The rush of springtime homemaking and breeding has settled down and the birds are trying to keep cool even by 8 or 9 in the morning. With not much going on with bird life in the park, I thought it might be good to mix in a few photographs of some of the things I blog about at Turkey Creek. As I walked toward the park the entrance in the library parking lot, I heard some soft, high-pitched call notes in the trees, and caught some glimpses of Northern Parulas foraging quietly together. One of the birds caught my eye. It’s yellow “spectacles” gave it away as a Yellow-throated Vireo. This vireo species’ plumage is very similar to the Northern Parula in many other respects (particularly with worn feathers and in the fall), but the spectacles are diagnostic. 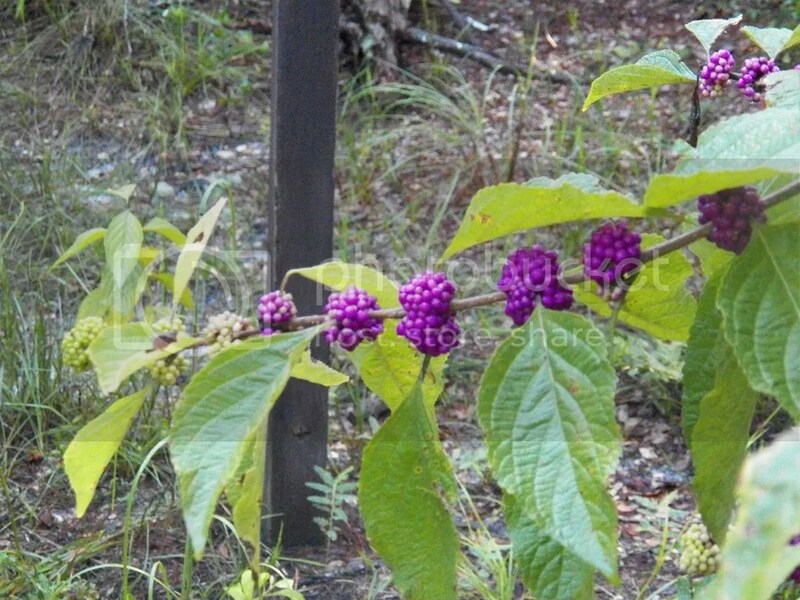 Now that we are well into summer, quite a lot of American Beautyberry plants are ripening. This plant is ubiquitous, and birds love to eat them. The Sanctuary has been quiet, even for summer, this year and this day was no exception. There were a few Northern Cardinals calling from the brush and one or two singing in the distance, but the usual cacophony of alarm notes and whistling I am used to hearing was again absent. I approached the Harris radio tower which sometimes has Brown Thrashers or Eastern Phoebes hanging out nearby. No such luck this time, but let’s have a look at the tower. 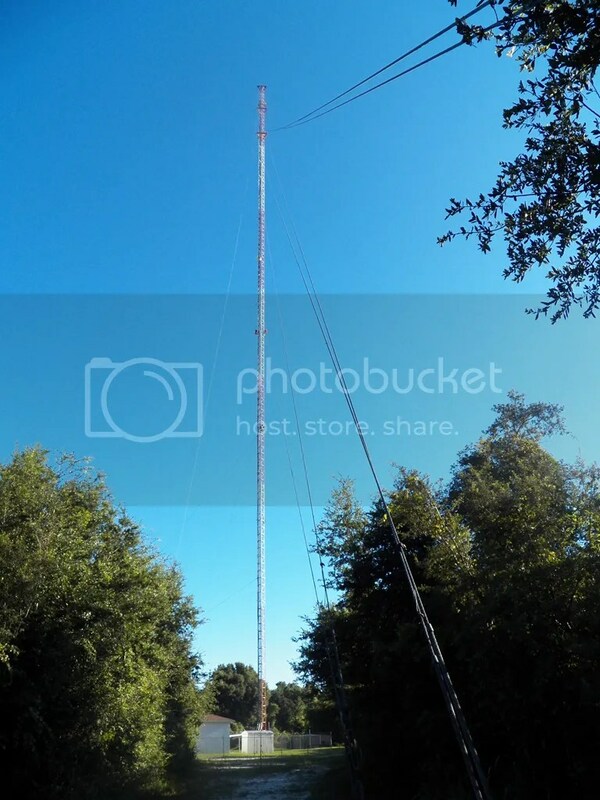 The tower is held up by 3 pairs sets of guy-wires, spaced 120 degrees apart. This 129 meter (400 foot) tower is owned by Harris Corporation, and I think it’s used for communications testing, rather than broadcasting. You can see from this photograph that the structure has supports fairly close together. I’ve been told by several people that years ago vultures and various raptors would roost on the tower, sometimes causing quite a smelly mess. To deter the birds from roosting, additional supports were added to the tower, making it near impossible for larger birds to make use of it. I am amazed that such a tall structure (and others like it) are supported by wires, anchored into the ground. This simple method works even in hurricane-force winds. The guy-wires holding up the tower are anchored in place with the help of these 1+ inch diameter bolts. 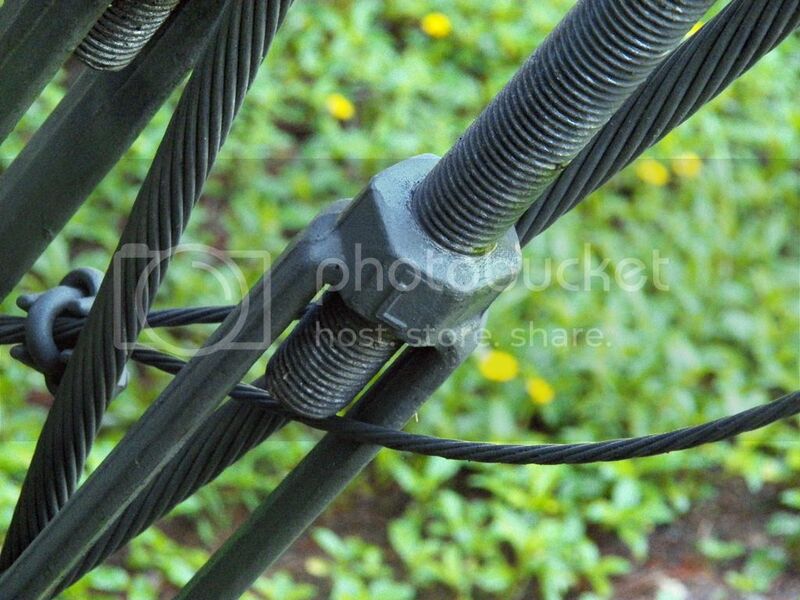 The smaller wire you see is a grounding line for lightning strikes. We have had a lot of rain the past week or so, and that was reflected in the elevated canal and creek water levels. I walked to the weir, where the Melbourne-Tilman Canal empties into Turkey Creek. There were only a few bird species present by the weir. Mourning Doves were the most abundant, and I flushed quite a few as I walked along the canal. In suburban settings, where these birds are commonly perched on utility wires, they are fairly conspicuous. Among the grass by the side of the canal they were almost invisibly until my footfalls scared them out. There were a few Green Herons, a single Tri-colored Heron and one American Coot by the flotation barrier leading to the weir. 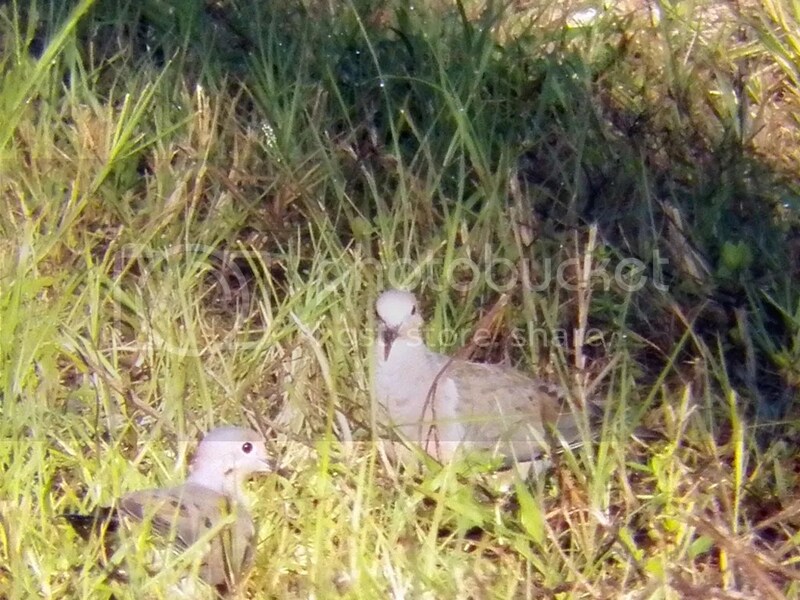 I saw a few Common Ground Doves and Eurasian Collared Doves as well. 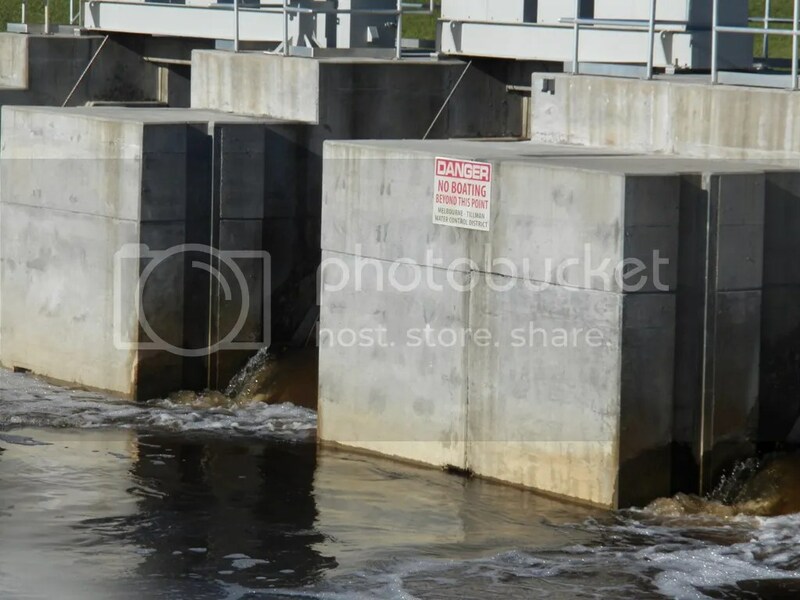 The weir itself is part of a drainage and flood-control system, using Turkey Creek as an outlet to keep the canal water levels down, especially after heavy rainfall events. 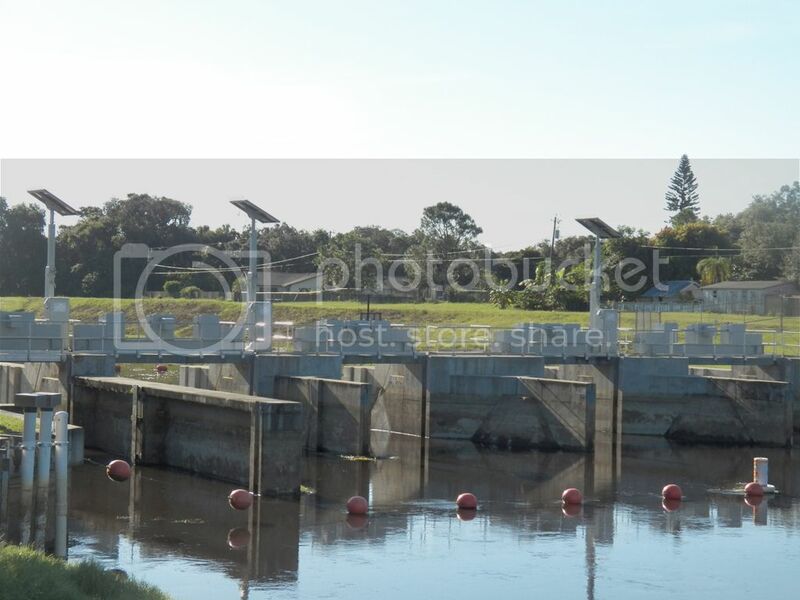 Flood control for the canal system. Two of the area streams, south of the Eau Gallie River, are named for birds. Crane Creek empties into the Indian River Lagoon near Melbourne’s downtown, while Turkey Creek flows into the lagoon in Palm Bay (and is the main feature of the Turkey Creek Sanctuary, of course). I don’t know the historical reasons for the names, but for the first time I documented Wild Turkeys at Turkey Creek. Technically, they were running alongside the Melbourne-Tillman Canal, but based on the direction they were traveling, they had to have been along the creek’s side to get where I photographed them. 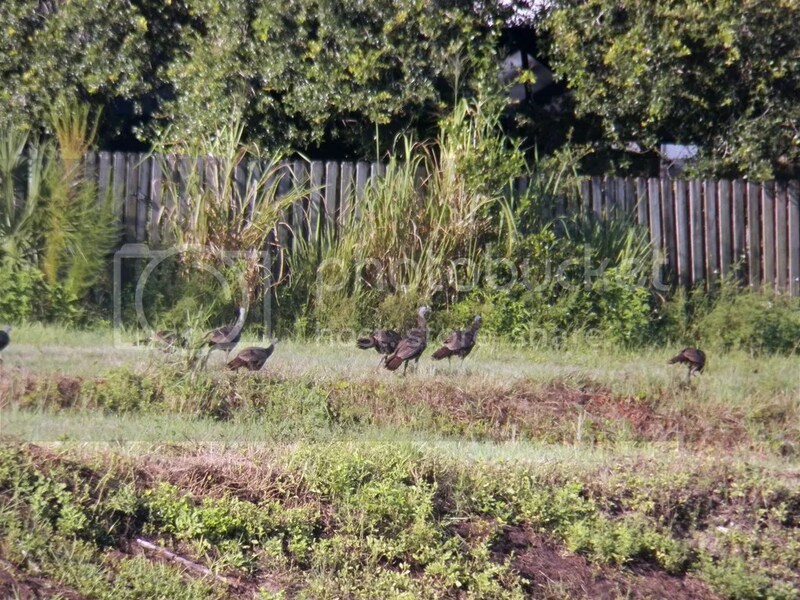 I found it slightly ironic that I spied them running alongside the residential neighborhood that abuts the sanctuary. The turkeys made their way out of sight, and I made my way back into the sanctuary. 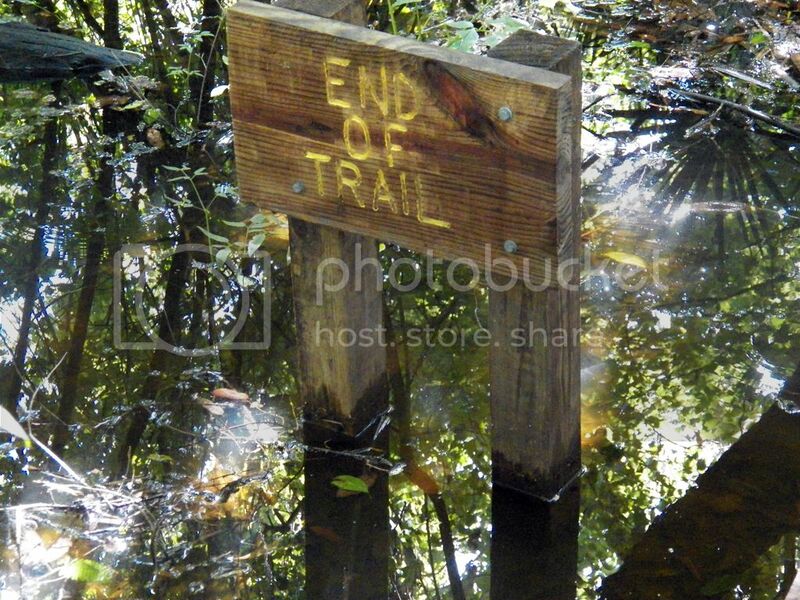 Upon entering the woods, there is what I’ve been calling an “emergency” boat ramp. Normally there is a heavy chain across the entrance to the path that leads to the ramp, but I noticed that it was missing (though the sign clearly indicated this is not for pubic access). This also happens to be the area I saw the Bicknell’s Thrush this year. I don’t know if it’s really for emergencies or not, and I freely admit I pass the signs and chain regularly to have a look at the creek from the ramp and it’s adjacent platform. 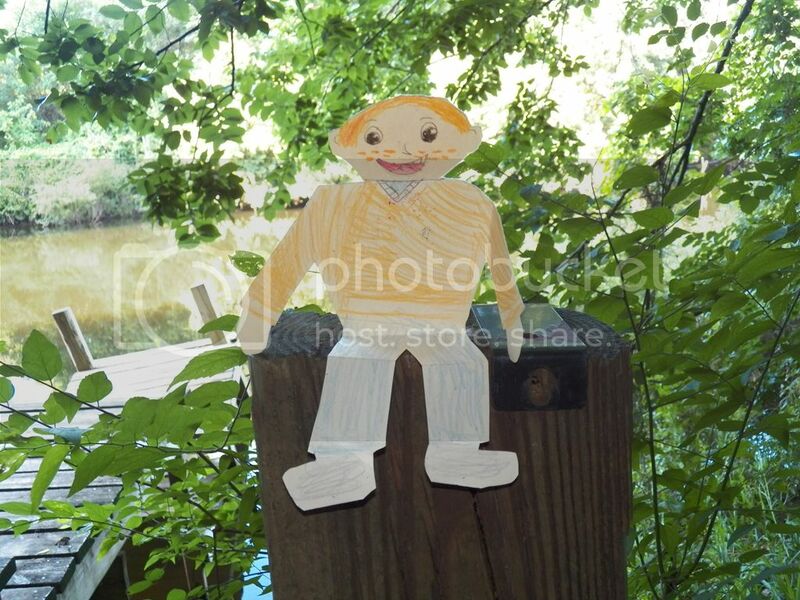 In fact, I took a photograph of Flat Stanley there earlier in the summer. You can see the platform and posts in the background and to the left of Flat Stanley, when the water level was lower. 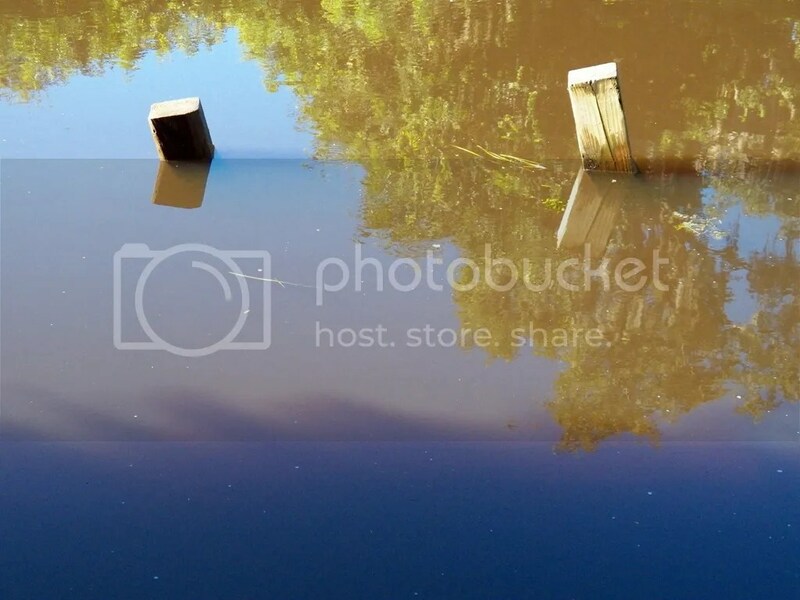 After all the rain we’ve had, the creek level was several feet higher than my last visit, almost completely submerging the wooden posts for the platform next to the ramp. I worked my way to the boardwalk and, apart from a couple of distantly circling vultures and some Carolina Wren calls, I didn’t have much luck with finding birds. 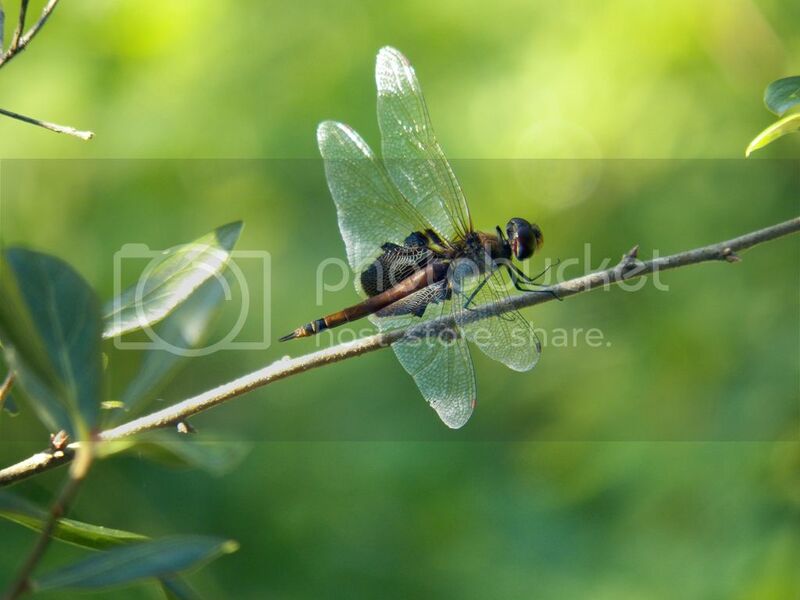 There were plenty of dragonflies. This one, like many others this late in the summer, have very worn-out wings and rest as often as they are flying. 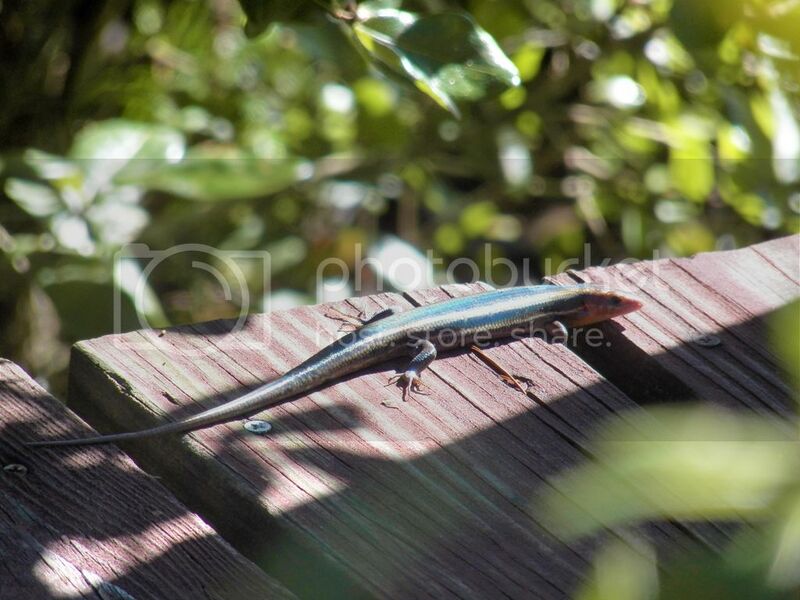 This Mole Skink was sunning itself on the boardwalk. If you look closely you can see water beaded up on its skin. Despite the shiny appearance, skinks are not slimy or wet. Their scales are exceptionally smooth and close-fitting. The camera had a bit of trouble picking up the brilliant blues and overall iridescence of this animal. See the shiny skink sunning in the sanctuary. 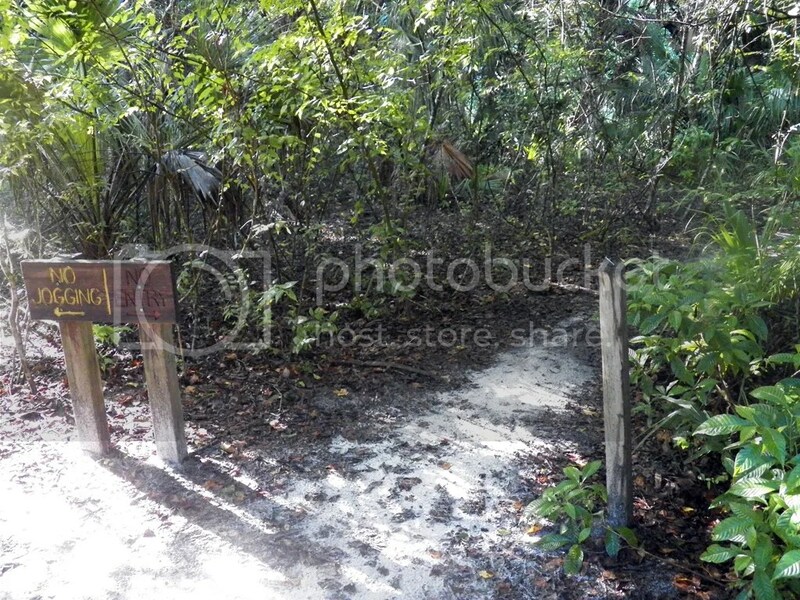 Further up the boardwalk and the Sand Pine Trail, I detoured onto the Flood Plain Trail. I was expecting the Boy Scout’s boardwalk to be at least partially under water, but it was not – a testament to both the flood control efforts at the weir and the capacity for the ground near the creek to hold water. The ground was covered in standing water, but still several inches below the decking. Apart from a few Yellow-throated Warblers a the entrance end of the Sand Pine Trail, that’s about it for the day. 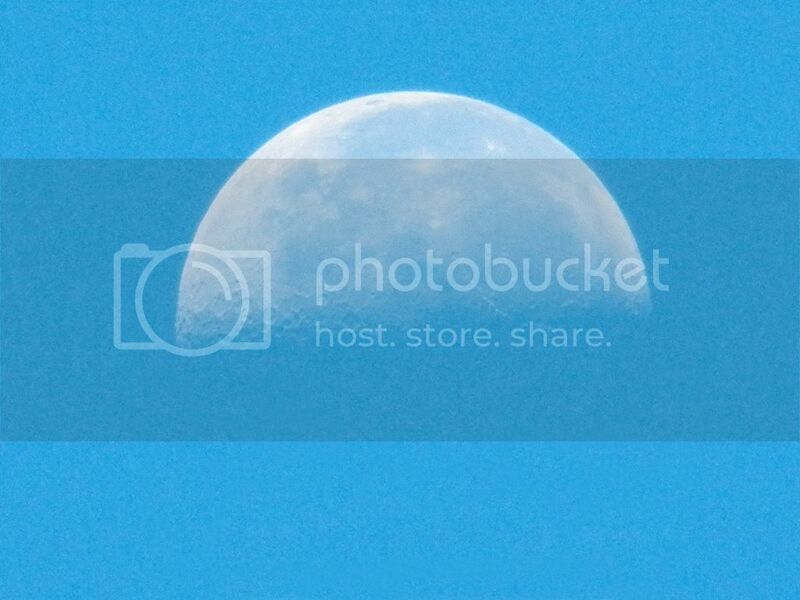 The nearly last quarter moon shone brightly enough, even in daylight, to provide a nice parting shot. Posted on 2014 August 21 2014 December 31 by Lonely BirderPosted in BirdingTagged bird watching, Birding, birds, Turkey Creek Sanctuary.